1999-2001: Scientific advisor for the BBC productions "Walking with Dinosaurs" (2000) and "Walking with Monsters - Life Before Dinosaurs" (2005). 2003: Scientific advice for the episode "Baltisches Gold - Auf der Spur der Bernsteinsucher" (PDF) of the German TV documentation series "Wunder der Erde" with Prof. Waldemar Bauer (first aired May 29th 2003 on ARD / HR , and repeated on Febr. 19th 2006 on 3Sat). 2003: Studio guest and co-worker on the script for episode "Bernstein - Gold der Ostsee" (PDF) at the German science magazine "Planet Wissen" (PDF) on the issue of amber and amber inclusions (recorded on Oct. 6th and first aired on Nov. 20th 2003 on SWR / WDR, with several later repeats on the regional services of ARD) (watch on YouTube Part 1 and Part 2). Febr. 2009: Interview for the German news magazine "ZDF-Mittagsmagazin" about Charles Darwin and his theory of evolution on occassion of Darwins 200th birthday (aired on Febr. 12th 2009 12:00 on ARD) (watch on YouTube). Sep. 2009: Two interviews for the German SWR TV-magazine "Landesschau KulTour" (PDF) about the Darwin Year special exhibition "Der Fluss des Lebens" (aired on Sept. 26th 2009 19:15 on SWR) (watch on YouTube). Dec. 2009: Studio guest at "Sky Magazin" with interview about evolution and the movies "10.000 B.C." and "2012" (aired on Dec. 14th 2009 at the German Sky Channel) (watch on YouTube). Febr. 2010: Interview about Darwin and evolution for the ZDF/3Sat science magazine NANO (PDF) (recorded in Oct. 2009, aired on Febr. 18th 2010 on 3Sat) (watch on YouTube). Jul. 2011: Interview for L-TV (recorded on Jul. 19th) about the new fossil insect order Coxoplectoptera (aired on Jul. 19th 2011 18:00 at the German channel L-TV) (watch on YouTube). Jul. 2011: Interview for Regio-TV (recorded on Jul. 19th) about the new fossil insect order Coxoplectoptera (aired on Jul. 26th 2011 at the German channel Regio-TV) (watch on YouTube). 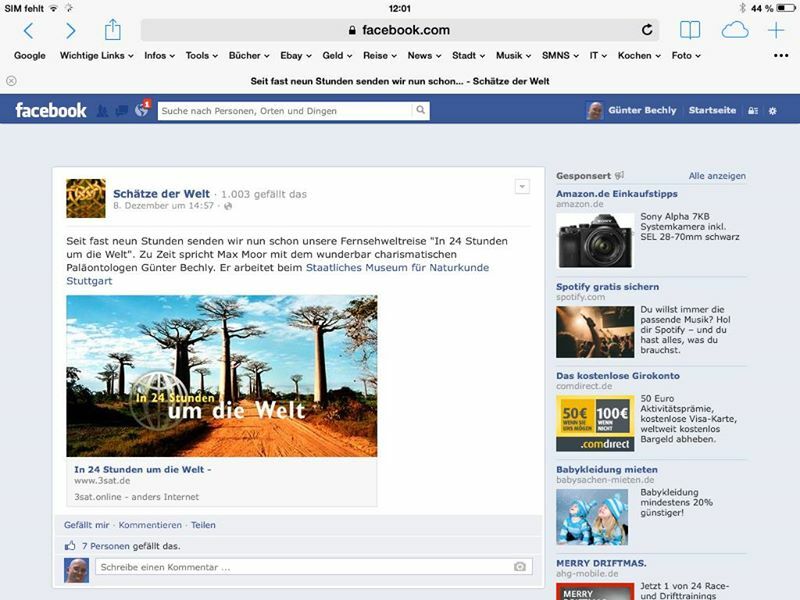 Dec. 2013: Four interviews (45 min., recorded on Oct. 23rd) by the famous Austrian actor Max Moor for the TV-special "In 24 Stunden um die Welt" (PDF, Facebook posting) about Earth history, evolution and paleontology (aired on Dec. 8th 2013 at the German channel 3Sat) (watch on YouTube). May. 2014: Interview for Regio-TV on our discovery of a fossil link between wingless and winged insects (recorded and aired on May 13th 2014 at the German channel RegioTV Stuttgart) (watch on YouTube). 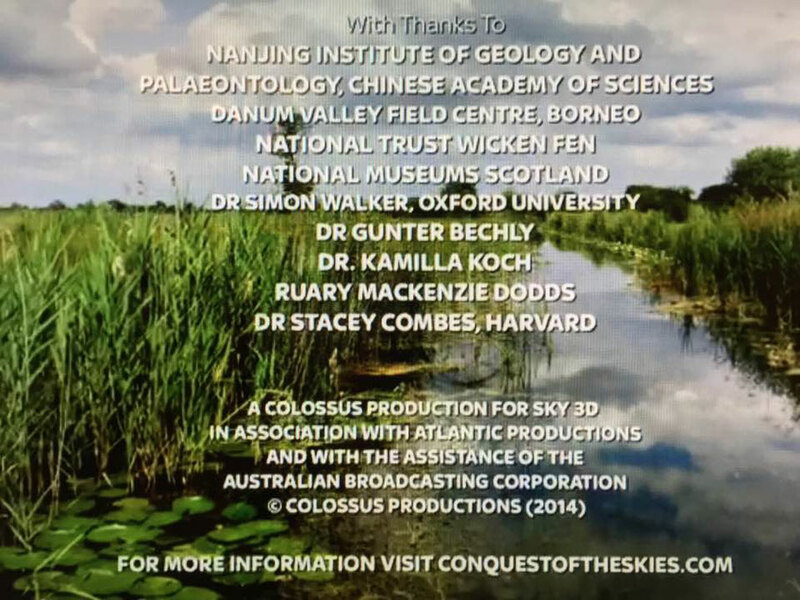 2014: Scientific advisor for the first episode "The First To Fly" of David Attenborough's documentary "Conquest of the Skies 3D" (aired Jan. 1st 2015 on Sky1).